Dealing with themes such as migration, family, and the environment, Katrin Koenning’s work is characterised by an experimental aesthetic that does not shy away from vernacular, snapshot-style language at times, while adopting a grander, more elegant tone at others. Her broad sweep of visual vocabulary and the intimacy of her vision allow her photographic work to test new ground, probe at questions that are hard to answer directly or definitively, and provoke questions of its own. 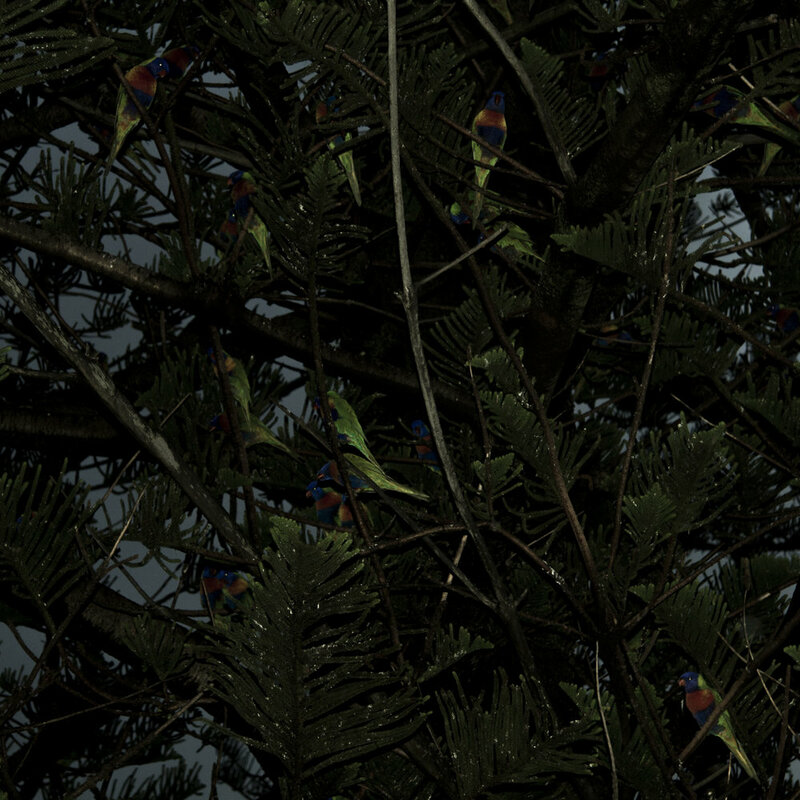 Koenning’s newest work, The Crossing, is an exploration of “human impact and a ‘wounded’ Australian ecology”. 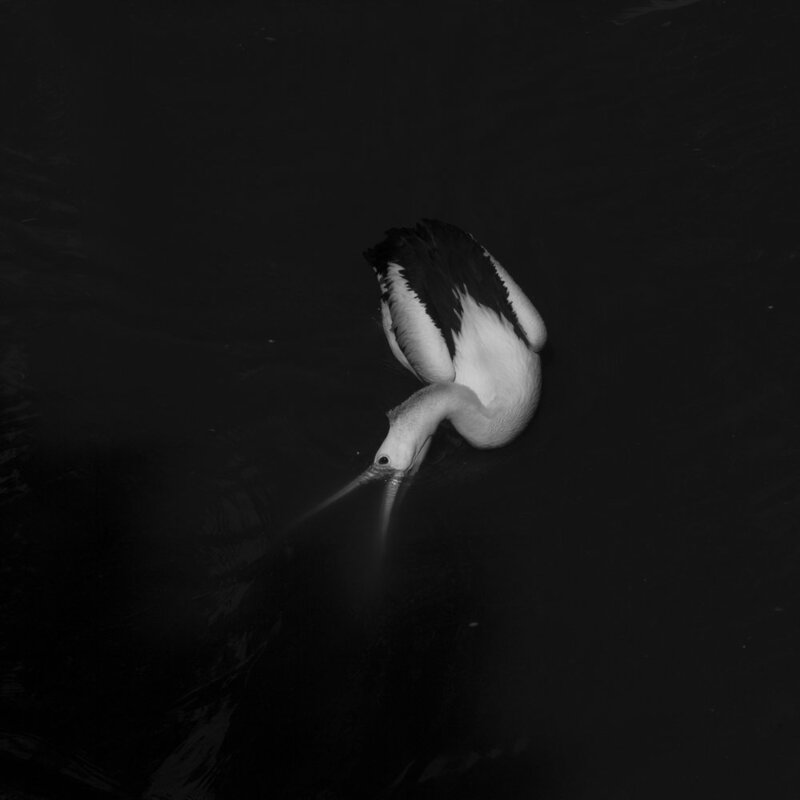 The images are dark, brooding, somehow secretive, even when they depict a lush forest or a tropical bird; the ambivalence Koenning feels towards the legacy of humanity’s footprint on the environment throbs in the pictures. The photographer makes masterful use of darkness as a communicative tool, and when light appears, it is as a scarce and distant gift, often emanating from an unseen clearing, or reflected by an animal or human form; it is not inherent. Koenning plays with scale (are we inches from the seabed, or many feet above a hillside?) and muddles the line of vision: a mountainside through a dirty window, a seascape through a cloth, pelicans in a cage. In Koenning’s hands, we are face to face with the calamity of the Earth, the things that are happening to its landscapes and its species; The Crossing is like dropping a pearl into murky water and watching it sink from view. Based in Melbourne, Australia, Koenning has an extensive international repertoire of exhibitions and publications, including a book, Astres Noirs, published in 2016 by Chose Commune. Ahead of her exhibition at Hamburg Triennial, I spoke with Katrin via e-mail about distance, photographic questioning, and the poetics of the visual. Alice Zoo: Looking at all your work together, I’m struck by the contrast between the intensely intimate and personal — the “hair on the pillow”, as you wrote so beautifully for your project Near — and then the macro, large-scale view you adopt at other times, examining massive themes like the adaptation and transition of nature, and the ecology of Australia. I was wondering if you could speak about that impulse to zoom in at some times and zoom out at others — how those impulses sit together, and how your mentality at a given time informs what you’re choosing to shoot? As you’re often pursuing these project concurrently, are there certain times or moods where you feel more inclined to focus on one or the other? Katrin Koenning: I suppose that mostly, and honestly, it is intuitive. Whether small or large, things tickle you, and you start thinking. If they still tickle you a while later, you begin to make work. You kind of just have to. If I had to theorise my answer: perhaps there isn’t a grand hierarchy by which my eye meets the world, or to what matters to my gaze, or even to my visuality itself, in a way. In this sense, everything matters — everything deserves to be seen, and everything has urgency. The spectacular, the trivial, the things in-between… Mind you, my work doesn’t really deal with spectacularities. It centres mostly around trivialities, the ‘everydayness’ of things practiced by way of a kind of slow looking, and this idea that by reconstituting your way of seeing (abandoning the hierarchy) you can give worth to something. Suddenly, and within context, the hair on the pillow is removed or shifted from a hair-being into something else, becoming a signifier: it is now the thing that represents love, age, loss and so forth. Birdshit is birdshit until you shift your vision and it becomes a universe. Or an oracle. Or a work of abstraction. But even if it doesn’t become something other (or even something greater) it matters because it is, now, here. It is proof that we exist. Maybe the smallest things hold the greater truths about who we are. All my work, sweeping or minute, is in its core connected to my life. It always comes from a place of something that has touched me, both in the sense of sentiment and circumstance. If I had to theorise further, I could argue that the act of zooming in and out, of shifting between the small and the grand, is then a kind of way or actual method to say (to yourself and to the world) that everything matters; a means of thinking that, for me, was first born from — and again heightened by — the experience of loss. If, by shifting our prioritised gaze, we can begin to see the worthiness of things that we’ve long decided unworthy of being seen, or that due to our conditioning we never even saw in the first place, we are equalling the order of the world (only in relation to ourselves, of course). We are also freeing ourselves from one kind of burdened seeing — the one that functions as a measurer of worth of worldly things, or a ‘labeller’. The one that contributes so much to how we evaluate our own lives — by way of the grand. Here is a first undoing of our captivity to the structures we are told to belong to and act by; only the grand, only the glorious, only the best matter. Get health insurance now because you may become frail; buy a house; be on TV; win every popularity contest in town (no wait, in the world! ); and so forth. Everything around us dictates a hierarchical looking, and of course corporations, the media, industries have a vested interest in this idea; it’s a means of control. I don’t want to imply that every act of seeing differently is an act of rebellion — but maybe it is? A stone on the path is a stone on the path, or it is a stone that matters because it exists, and so do I. The stone ties me to the thing I love the most — the world — and in our exchange, we confirm each other’s existence. I’d like to think that all this also informs my more zoomed out works such as The Crossing, dealing with something larger but assuming a intimate visuality; one that is personal and felt, and that forever seeks to draw closer. The pursuit of several projects at once is also a thing that allows me to belong to multiple worlds. AZ: Absolutely. I’m struck by the way that all your projects — irrespective of subject matter — are linked by the “intimate visuality” you mention. The way that even your view from an airplane window can feel tender via your capturing of the sparkles of light on the grain of the plexiglass. I think that "everything matters" is a particularly unique position for a photographer to take, as often photography suggests a directional vision, a kind of pointing: to photograph is to say "look at what I’ve chosen to put inside the frame, and not what I’ve left outside it.” So to be able to use image-making for a kind of democratic looking, rather than a hierarchical one, is a challenge, and on that basis it makes sense to me that your subject matter would have so wide, or so deep, a range. It all seems to flow from a position of caring deeply and indiscriminately about all that you come into contact with, and the actual surface of those things is less important than the attitude of looking through which they’re depicted. That point about non-hierarchical looking brings me to the way you include human figures in The Crossing: a ghostly illuminated hand, the brief flash of the sole of a foot as it disappears into the dark. In this project, humans and animals are handled the same way: unknowable creatures, captured briefly by the camera before they recede back into the ecosystem they’re a part of. Regarding The Crossing more specifically, I was wondering about the narrative of its coming to take shape. Was it a fixed concept from the outset in 2009 which you pursued slowly; or was it more the case that you were following impulses to shoot and then, looking back over your work, realised that certain themes had come to the surface and would sit well together in series? Is the project finished? If so, with a work like The Crossing that deals with something as enduring as nature, how do you know when to stop? KK: In 2009 I relocated interstate, from Brisbane (Queensland) to Melbourne (Victoria). My life shifted, and with that my priorities; where nature had always been my safe place, now it played an even bigger role. I was thinking a lot about life, and what matters, and about love, and about giving back. So important: to give back to the things that have taught you love, whether that’s photography, or your partner, or a tree down the road. That same year, we had huge fires sweep across large parts of Victoria and cause immense destruction. A lot of people died. The fires (to date Australia’s worst), known as the Black Saturday Bushfires, caused great damage at Lake Mountain, an alpine region 120km north of Melbourne, changing the site forever. In 2010 I began making a work there (still in progress), thinking about climate change and our impact on the Earth, and how a land transitions from wound to regeneration. During this time, the first images for The Crossing emerged, made largely across regional and remote parts of this state and also on Moreton Island in Queensland. The images came from a similar vantage point or question as the work I was making at Lake Mountain. I knew I needed to make them, and that one day they would come together, but for the time being, and for quite some time to come, they were free. They belonged and they didn’t at the same time. They were all over my archive, but consistently. I knew they would find each other to become a ‘thing’, but I didn’t know how, or when, or of their form. It was only some years ago when I came across Michel Serres’ The Natural Contract, a brilliant work of urgent poetry, that everything fell into place in my head. You know, it was one of those moments where things are suddenly so clear. The work is ongoing but I’m in a different chapter now, at least visually. AZ: Could you expand on that idea of “urgent poetry”? I feel it has so much bearing on the nature of your work, and especially The Crossing: images or narratives that are allusive and restrained, in many ways, but that deal with pressing themes. Often photographic work about social, political or ecological concerns can be quite sensationalising, using imagery to shock the viewer into action or response, but yours is much more suggestive and, yes, poetic. How do the urgent and the poetic correspond in your work, and do you trust that the urgent will always be understood in images that are often so still, placid, gorgeous? Does it matter if it isn’t? AZ: I think that kind of questioning is incredibly productive ground, both for the viewer and the artist. In my own work, I find that it’s almost essential that a degree of my curiosity goes unsatiated, as that’s what spurs me to keep making work: the hope that eventually I’ll land on whatever unknowable thing I’ve been trying to make out. When you reflect on the ongoing learning and questioning that you’ve engaged in via photography throughout your career, do you feel that over time you’ve circled closer to any answers, if not for an audience then for yourself? Are there things that photography has helped you learn or settle, conclusions that you’ve come to through experiments with the visual, be those conclusions creative, personal, or emotional? KK: Oh yes, totally, and the learning never stops. I mean I think it is such a big part of (a documentary) method because you have all this time! In a documentary practice, time is the greatest gift, and this idea that you can return to things; you know, a strip of coast or a village or a mountain or a person or group of people… even a wall down the road. The returns enable you to know, the knowing makes you love, the loving authors you. Something like that. Having said that, I truly don’t think we know much at all. We know our lived experiences, yes… But of course the more you engage with something, the more you learn about it. If you return to the same alleyway for an entire year, day in day out, you will know exactly how and when the sun will flood into it at any given day of the year, and hence you’ll know which days you need to go in to create the mood you want to create in your pictures. You will also know, if your eyes are open, an entire number of people and their habits. You’ll know what kind of shirt they like to wear, you’ll know which way they comb their hair, always over and to the left, and you’ll know their work pass will always be tucked into their left shirt pocket, hidden but close by. You may even know when they’re having a good day. Purely by the gift of time. More generally, I believe photography teaches you an enormous amount about yourself, helps you make sense of things, and of course it also challenges you equally. Whether you circle closer to any answers over time I don’t know, you probably do, but I wonder if those answers throw up new questions instead? As I don’t apply one and the same formula to all of my work, for me the question of language really is always a fundamental one, and how to speak to something to do it justice, and also to let the thing speak for itself. This question gets answered differently and individually for separate bodies of work. AZ: I’m drawn to that notion of photography as a method of learning about oneself, and of challenging you at the same time. It can be a personal practice first and foremost, and then we’re left with images as traces of that practice and that learning. Turning, finally, to that question of finding the right visual language: I just wanted to speak briefly about colour with reference to The Crossing. I think it’s worthy of note that you’ve chosen to approach questions about ecology in monochrome; how did you come to that decision? And then, regarding the colour images from the series: I adore the brief visit of the waterfall in colour towards the beginning, then the later suite of colour images that seem to bloom in richness then retreat back into the dark. When sequencing the images, how did you decide which images should be in colour? How did you decide on the order for the project, and what function does that brief blossoming of colour serve? KK: A lot of the older works were made on black and white film and it felt right from the beginning, but also the darkness and melancholy (particularly inherent to the black and white images) were something I was feeling at the time when I’d find myself thinking about us as a humanity, and Earth, and the unfathomable amount of damage we inflict on it and on each other. This overwhelming feeling of breaking point (Serres talked about our collective weight acting as a tectonic plate onto the world in 1990) and a deep anger at a conservative government that continues to favour short-term economic growth over long-term investment in positive ecological transformations and climate action/adaption. I mean, the scheming for Adani’s Carmichael Mine (one of the largest coal mines in the world if it went ahead, and certainly Australia’s largest) was already in full swing during the 2014 Paris climate summit! Imagine that – it’s insane! The works needed to have some of my anger in it, so where overall there is a great tenderness or even love, some pieces are violent or ruptured. I wanted the work to be heavy, but it needed the colour to also have a lifting point, and to go back to what is at stake. The colour leads into my next ‘chapter’, which is colour and (being made around a number of small ecologies) looks at how things are in relation to each other rather than apart. It still responds to my feeling about the state of things and this moment of collective urgency in which we find ourselves. At its heart it seeks to counter a narrative of disaster capitalism and offers a more affirmative ecological imaginary. Like all my other works, the Crossing pictures aren’t necessarily locked into one specific order but, rather, they query to be played with (in an exhibition or book scenario, for example). While of course certain pictures have a particular impact when read in proximity, I love this idea that singular narrative pieces within bodies of work are sort of free agents and can come together in different ways, thus new image pairings create new image-dialogues. The overall notion of the work remains the same. Katrin Koening's The Crossing is on display as part of Enter at the Hamburg Triennial from 8th June.